"So the Senate wouldn't pass my plans, eh? Wouldn't let me build my New Rome? But if the old one is burnt, if it goes up in flames, they will have no choice! Rome will be rebuilt to my design! Brilliant! Brilliant! " As Delos is poised to kill Ian, he strikes towards Nero, whose guards attack Delos. Ian joins in and they manage to escape, promising to return for Barbara. Poppaea speaks with Tavius and tells him to get rid of Barbara. He finds her, and Barbara tells him that she's seen Ian. Tavius promises to help her escape and tells her the Poppaea wants her dismissed. She tells him of Nero's plan to send Maximus Pettulian to the arena. 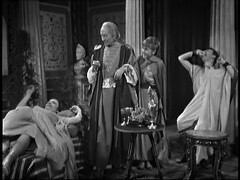 The Doctor tries to date when they are and realises that Nero is due to set fire to the city. Tavius tells him of what Nero plans and says he must kill Nero today. The Doctor is shocked to discover this is what was planned. He plans to leave, but Nero arrives saying he has a surprise. 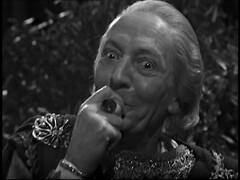 Nero is shocked when the Doctor knows what is to happen. 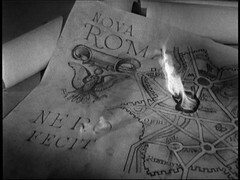 The Doctor sets fire to Nero's plans for rebuilding Rome which gives Nero the idea to set fire to the city so he can build his new Rome. At night Barbara waits for Ian, while he & Delos try to get past the guards. They gain entry a crowd of peasants who Nero has had hired to set fire to Rome. Tavius spots Ian and takes him to Barbara. 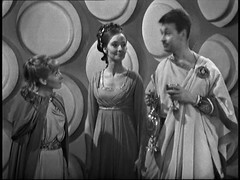 Tavius furnishes Barbara with a disguise, while the Doctor and Vicki try to sneak out of the palace past the guards who are only looking for people trying to get in. 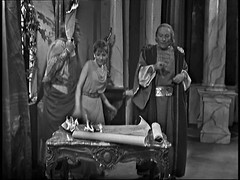 Delos escorts Ian & Barbara from the palace while Tavius, revealing the cross he keeps hidden on his person, wishes them good luck. The Doctor & Vicki watch Rome burning. 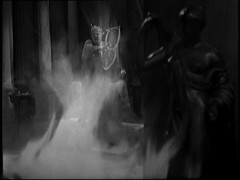 The Doctor is amused at the thought the fire of Rome may be his fault while Nero plays the Lyre amidst the flames. 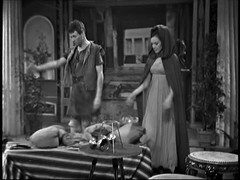 Ian & Barbara return to the Villa, finding the remains from the fight in the first episode including the jar Barbara hit Ian over the head with, which causes Ian to realise that Barbara was responsible for his troubles. The Doctor & Vicki return and they all leave for the Tardis. 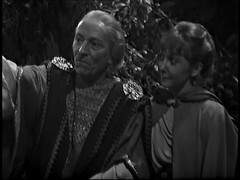 Vicki wonders where they will go next but the others hint to her that the Doctor may not be able to control the ship. The Doctor is worried: a force has captured the Tardis and drags it down. DOCTOR: Oh, my dear Caesar Nero. NERO: I have a surprise for you. Guess what it is. DOCTOR: Well now, let me think. You want me play in the arena? DOCTOR: Well, it's no problem at all, after all, you want to do your very best for your fellow artists, well, why not the arena, hmm? NERO: Yes, yes, of course, that is exactly right. NERO: You'll have to play something special, you know. 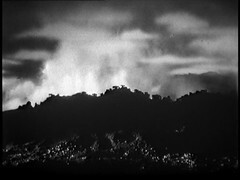 But behind that there's a plot to kill Nero, which Tavius appears to be directing, and the episode is dominated by Nero's descent into madness. I've smiled at the humour in the story, the narrow misses, contrivances but don't find it as funny as some people do. However watching it episodically has again massively improved my regard for the story as a whole. Derek Francis' Nero is a fine turn and Michael Peake is great as Tavius. The Great Fire of Rome is a historical event, dated to the night of 18/19 July AD64 and lasting for over five days. Legend claims it was started by Nero who played the fiddle while Rome burnt. Fiddling would have been an anachronism, the fiddle having been invented many years later. At the time of the fire, Christianity existed in Rome, but was persecuted so having Tavius as a Christian concealing his faith is a nice little touch. Indeed the fire of Rome was blamed on Christians many of whom lost their lives in the aftermath. Nero had persecuted Christians for much of his reign, there are tales of him having captured Christians burnt in his garden at night as a source of light. As such there is perhaps motivation for Tavius to be involved in such a plot. 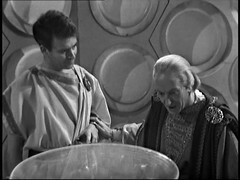 Hidden away in this episode as an uncredited extra is a first Doctor Who appearance for First Derek Martin. 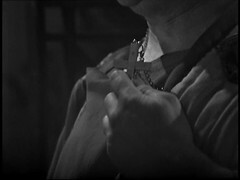 He'll return in The Massacre: Priest of Death as a Parisian in Rue des Fosses St. Germain, The Web of Fear: Episodes 1 & 4 (he's in the big battle scene) as a Soldier, Spearhead from Space: Episode 4 as a Soldier killed by Auton (uncredited), The Ambassadors of Death: Episode 3 & 4 as a Thug, Inferno: Episode 7 as a UNIT Soldier, The Mind of Evil: Episodes Three and Four as a Prisoner, The Claws of Axos: Episodes Three and Four as a UNIT Soldier and Image of the Fendahl: Part One and Two as David Mitchell, the only role he's actually credited for. 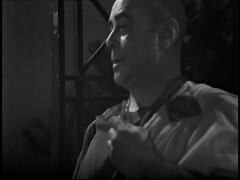 For most of this period he's operating as a Stuntman, who was a member of HAVOC, as well as an extra but his acting career eventually brings him fame as Charlie Slater in Eastenders. His webpage is at http://www.derekmartin.net/.